Ever have one of those moments where you have to pinch yourself to make sure you’re not dreaming? I have to be honest, it hasn’t happened to me many times. But…as you first start walking up the stone steps to this villa you just may start rubbing your eyes in disbelief. When you reach the top of the steps, it’s the feeling of being on top of the world. 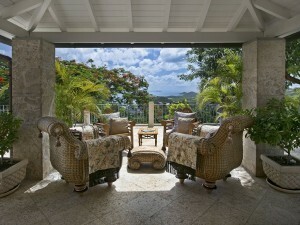 Standing on the open lanai and staring out to the Caribbean Sea and gazing at the dotted islands in the distance below. Then walking through the wide and open spaces of the villa. With each turn you see something else that grabs your attention and inspires awe. You won’t believe you’ve actually arrived. That you will get to spend your time on the island in this place of wonderment. 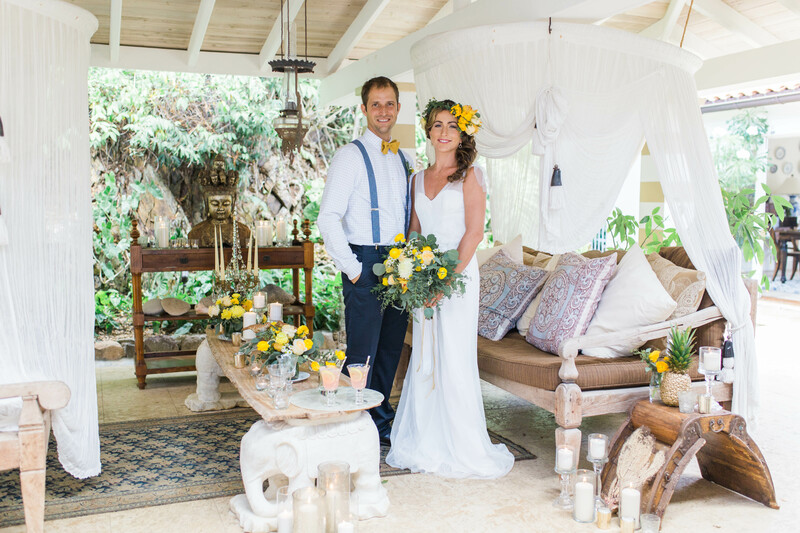 That you will share your wedding vows and precious moments with the ones you love in a place of such utter beauty. 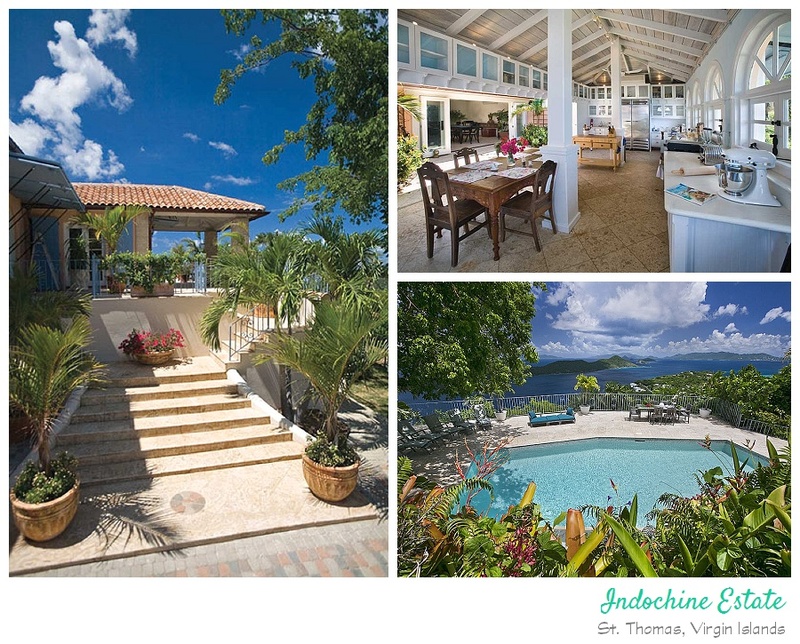 Indochine Estate sits high atop a mountain on the Northside of St. Thomas. The sprawling estate includes everything desired for the trip of a lifetime. And the wedding of your dreams. The estate hugs the mountain on 3 lush, tropical acres. The floor plan is almost entirely open to the continual breezes off the sea. A swimming pool and patio area awaits just outside your door. A small garden path off the pool leads to a covered yoga retreat away from any sounds other than the ocean and wind. Your stay here will be more relaxing and memorable than you could ever imagine. You, your love and up to 8 of your closest family and friends can make Indochine your home for your time here in paradise. There are 4 bedrooms scattered throughout the estate. The Master suite includes a queen-size bed, ceiling fan and an air-conditioning unit. An outdoor shower provides a true island oasis. Bedroom #2 has a queen-size bed with ceiling fan, air-conditioning, French doors and a terrace. Bedroom #3 has a king-size bed with ceiling fan, air-conditioning, French doors and a terrace. Bedroom #4 has a king-size pull out futon/sofa bed, ceiling fan, French doors, air-conditioning and a terrace. A large living room with six sets of French doors, ceiling fan and huge couches. An enormous open air kitchen made for a grand chef or a full-service, catering team. The kitchen is stocked with all appliances, dinnerware and cookware. The stove is an 8- burner, Vulcan double stove. Space and seating for up to 65 guests! 2. Swimming pool: the pool can be heated, but surcharge is required due to the high cost of electricity on the island. But quite frankly, with our average year round temperature of 80 degrees, you shouldn’t need it. 6. A courtyard covered in lush, soft grass…maybe this is where you’ll say your vows! You will be met at the airport by a member of our team to take you back to the villa and to give you a tour of the estate. When you arrive at your vacation villa you will be welcomed with hors d’oeuvres and champagne…not a bad way to start your vacation! 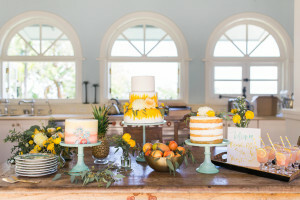 A short 5-10 minute ride to world-class beaches and all the entertainment and activities options you could want for you and your wedding guests.